Relay is a electro-mechanical switch used to control high power application through low power signal electronic circuits, for an example a simple timer circuit working under 5V DC bias can not control high voltage light bulb, by introducing Relay component we can easily control light bulb. Typical Relay contains Electromagnetic coil, N/O contact, N/C contact and Common contact, electromagnetic coil accepts low voltage DC bias and becomes electromagnet to attract the common terminal lever and interchanges the connection between N/C, N/O contacts. but most frequently used Relays are SPDT Relay and DPDT Relay both are acts as Electromechanical switch. If there is not enough DC supply in coil terminals then Relay represents idle condition that is common terminal connected in N/C terminal. When the coil gets required DC supply then coil gets Magnetically Energized and this magnetic flux force attracts common terminal lever which is made of iron and makes the connection to N/O terminal, now the N/C becomes open. Double Pole Double Throw (DPDT) Relay contains two coil terminals, two separate common terminals C1, C2 and two Normally Open (N/O1, N/O2), two Normally Close (N/C1, N/C2) terminals, this Relay makes two different connection and control with one control signal to the coil. 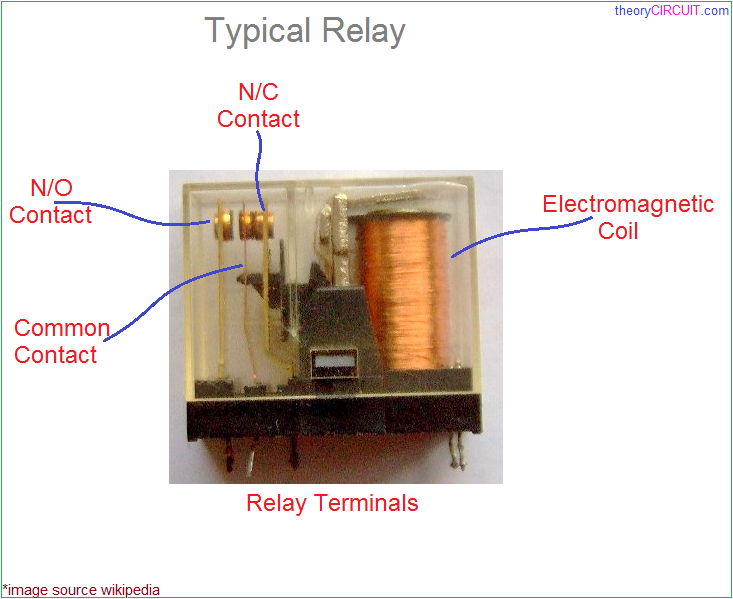 If there is no bias at coil then Relay stays in idle condition that is common terminals are connected with N/C terminals, when DC bias arrives to coil then it gets magnetically energized and attract common terminal levers and makes connection between common terminals and N/O terminals, now the N/C terminals becomes open and those terminals are works with their pairs. Here simple relay circuit given for an example, when there is no DC supply the bulb connected at N/O terminal remains off and When DC supply given to the Relay coil it get magnetically energized and attracts the common terminal lever to N/O terminal and the bulb circuit completes this step makes bulb glow.